Note From Cheiron: We strive, whenever possible, to provide images of used kits. However, in this instance, (since both the water and the crystals are clear) it was just not feasible! What Is The OilScreenWater (Crystals)® Oil in Water Test Sampling Kit Used For? 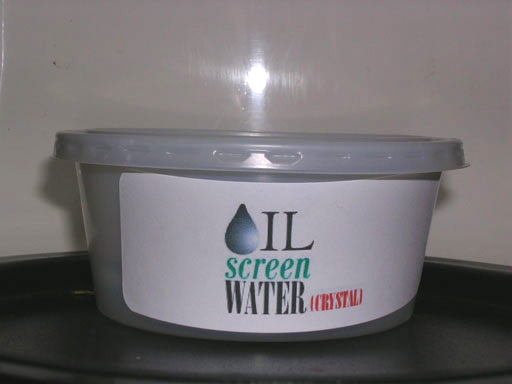 The OilScreenWater (Crystals)® oil in water test kit will detect a wide variety of petroleum hydrocarbons in water, including bunker oils, transformer oils, gasoline, motor oil, diesel, hydraulic fluid, and cooking oils - among a host of others! Transportation facilities and garages (bus barns, fleet vehicles etc) forestry and pulp and paper, environmental, aerospace, shipping/marine, manufacturing, petrochemical, utilities and autoshops and carwashes. The kits are also useful for oil in water leak detection and site remediation tests. In keeping with our desire to make to make our oil in watertests rapid, safe and simple a deminimus quantity of camphor is sealed in a convenient tear open packet. Our specially developed packet can contain camphor crystals for years without allowing the crystals to sublime. Prior to using this test, please rinse the testing container several times to ensure it is clear of oils transferred when handling the packets. To use this sampling kit - a water sample to be tested is placed in the plastic container provided. The crystals enclosed in the kit are sprinkled on to the water. The OilScreenWater (Crystals)® test is intended as a fast and easy absence/presence field tool only. It can not be used to either measure quantities of oil present, nor can it be used to identify specific oils or petroleums other than the general TPH indicator. The kit offers users a fast, reliable and inexpensive field tool that has has a +10ppm TPH capability. The only known interference comes from detergents or alcohols in the water (neither of which are typically encountered in a field situation). Interested In Trying This Product?